A real time snapshot of who's working on what and when. Store all documents & images against a Job and easily get them back again. Site History - Full instant access to all previous work at a given site. Easily manage your planned and reactive work. Create personalised quotes, job sheets, invoices and other documents that look the way you want. Communicate with your fields engineers quickly and easily. Take a look at our overview of some of the other frequently used features. We were looking for a system that was flexible so it could bend to our companies requirements. Completely off the shelf Job Tracker and with Sams help fitted out requirements perfectly. Great to work with. Organised and helped us through every step of getting up and running. The days training was well worth it. Love the fact we can create our own paperwork and have it all fill in for us. Highly recommend Job Tracker Professional. The Property Maintenance business is certainly one that can have a lot of communications flowing between many people. It's not unusual to have photographs, job sheets, works orders, purchase orders, Emails, Invoices, time sheets not to mention ongoing verbal communications. It can be a nightmare just trying to figure out where to keep this information and even harder trying to find it again. Job Tracker Professional solves this by storing all your communications in with the job. Once you load a job or quotation you have immediate access to absolutely everything you've stored previously. 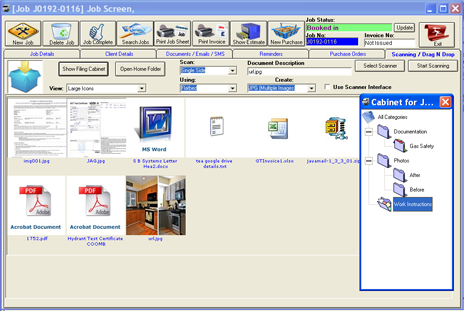 This also means all your networked computers running Job Tracker Professional also have immediate access as well. As Job Tracker Professional creates all your documentation such as job sheets, invoices, quotations, service letters, purchase orders, health and safety etc. for you, it automatically stores them for you and presents them back to you in an easy to read way. If you've got documents, emails or images that were generated outside of Job Tracker Professional that's all handled easily for you as well. Every Job and Quotation has their own filing cabinets which you can simply Drag N Drop absolutely anything into. Your ongoing verbal communication and progress with customers can easily be added to the notes section where is can be automatically stamped with the users name, date and time the notes were made. To safeguard you the notes can also be locked down meaning only authorised personnel can alter them once they've been stored. View easy to follow video tutorials taking you through the various features and functionality of Job Tracker Professional. Visit our Technical Tuesday section to browse common questions and answers from support calls. Click to see details of the latest available updates, see what's new and find out how to get it. View the latest company news, and follow us to keep up to date.